In lieu of recipe posts, I’ve decided to post (terrible) pictures of my shiny new Miss Knit socks!! Miss Knit is a good friend whose blog is attached to this one. She is the queen bee of knitting and decided to send surprise socks to lucky me. Yayaya! I loves them. So pretty and so warm. The socks arrived in the mail yesterday, just in time to cheer me up from the post-party blues. Thursday night, you see, MM, LG and the ladies threw me a ‘You’re Engaged!’ party. Twas glorious, complete with ‘bride to be’ ribbon, ‘i do’ napkins, tiaras, and ticky tacky heart-covered sequin garland. Fantastic!! We opened prezzies, drank wine, ate nibblies, and played ‘Block Drunk’, MM’s version of drinking Jenga. The night was perfect. But this morning, I woke up with the post-excitement blues. Nothing to look forward to for a bit except thesis-ing and marking (this is actually not true; I have heaps to look forward to but as none of it was happening thatminute, I was feeling blue). And I suddenly missed A. something fierce. Sensible Healthy Ezmy realized that a walk was in order, but when I went downstairs, I noticed a spiffy package in my mailbox. 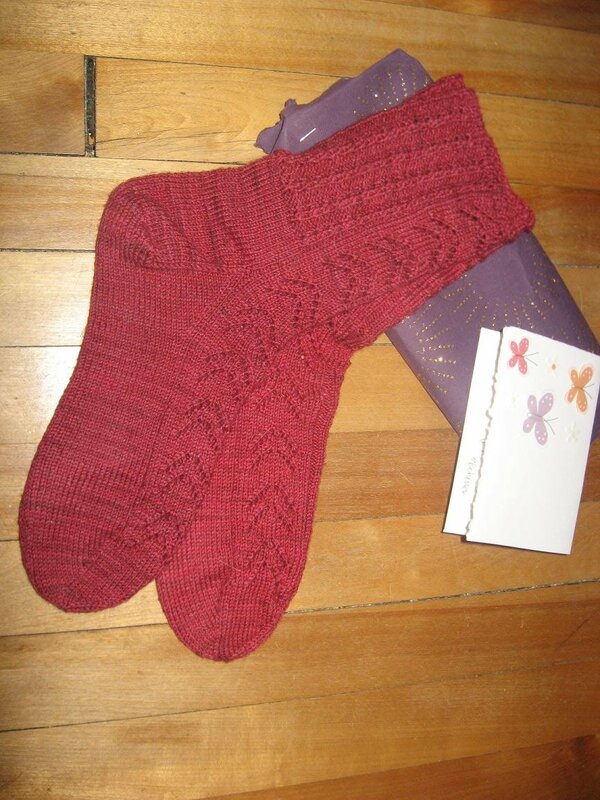 So yaya for cheery red Miss Knit socks! They saved the day!